I had a zucchini to use up the other day. That is how this paleo zucchini bread came about. I wanted to do a banana zucchini bread made with coconut flour. I also wanted my paleo zucchini bread to be only sweetened with dates. I am very please to tell you that this paleo zucchini bread came out great! If you like treats only sweetened with dates, you may enjoy this and this as well. 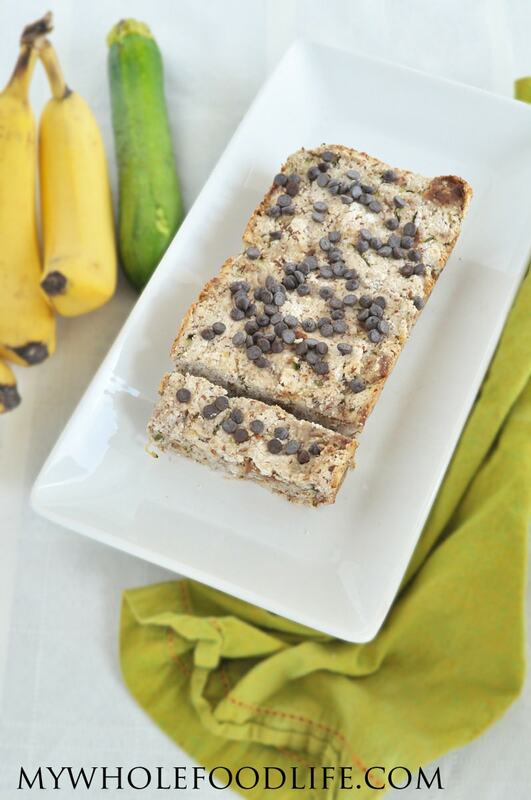 Not only is this zucchini bread paleo, it is also vegan and gluten free. I threw some chocolate chips on the top. I honestly think the bread is great on it’s own, I was just trying to make it look good for the photo. Feel free to add the chips or leave them off. A delicious and moist bread sweetened only with dates! In one bowl , mix the coconut flour, baking powder, cinnamon and salt. Drain and rinse the dates add them to a small blender or food processor . Pulse until they become a caramel-like consistency. You may need to add a tiny drop of water. Once the dates become a caramel, add them to a bowl with the zucchini, mashed banana and flax eggs. Lastly, add the dry ingredients to the bowl and mix well. Line a small loaf pan with parchment paper. Make sure there is enough room for some paper to stick out the sides. This will make it very easy to pull the bread out of the loaf pan. Spoon the batter evenly into the loaf pan. Let cool completely before removing from the pan. Once the pan has cooled, gently lift the bread out with the extra parchment paper. Store this bread in the fridge. It should last about a week. You can also freeze it for longer storage. Enjoy! Just a quick heads up, most baking powder contains cornstarch... which is not super ideal for those avoiding corn. Great recipe otherwise!!! I would like to make my regular zucchini bread but I'm trying to get away from cane sugar. Can I substitute it for agave syrup or maple syrup?